The rounded occipital condyles are located at each anterolateral border of the foramen magnum. A recession called the condylar fossa enclosing a condylar canal is located posterior towards each condyle and the large hypoglossal canal is located anteriorly and superiorly towards each condyle. A large, uneven jugular foramen created by corresponding of the jugular notch of the occipital bone and jugular notch of the temporal bone located laterally towards each hypoglossal canal is. 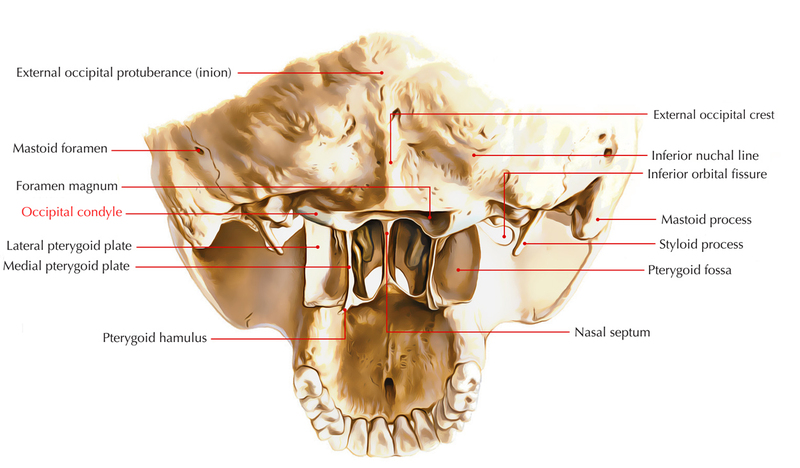 They are found one on each portion of the foramen magnum. The medial part carries occipital condyles. Jugular process is a quadrilateral plate protruding laterally from the posterior half of the occipital condyle within the lateral part. The exterior opening of hypoglossal canal conveying hypoglossal nerve is located laterally towards the anterior portion of the occipital condyle. Condylar fossa is the recession just behind the occipital condyle. Occasionally it has referred to as posterior condylar canal which is a foramen in its floor. The anterior margin of jugular process has a concave jugular indentation which creates the jugular foramen together with corresponding notch on the petrous temporal bone. The jugular tubercle is present on the superior surface of the condylar portion.